I just have to share this one pic of my baby (she'll be 2 in a few weeks so I guess she's not a baby, but she'll always be my baby ya know) We were at my mom's house and she's so cute how she follows my mom around helping her water the flower garden. I've had this idea of a pic I've been wanting to take of her in my mom's garden and this is pretty close to what I imagined. I have more of her with my mom's watering can too that are so sweet. I just love this one though, it's so special to me, and I know my little girl will love it when she's older too. Now I just can't decide, black and white or color? ooohhh Tough one.. but I think I like the black and white best! She really is such a doll! Both of them are adorable! She is so cute! I love your blog - I just came across it recently and I think you are so talented! i like the color one. so sweet. I am a fan of the Black and White! What a perfect shot! 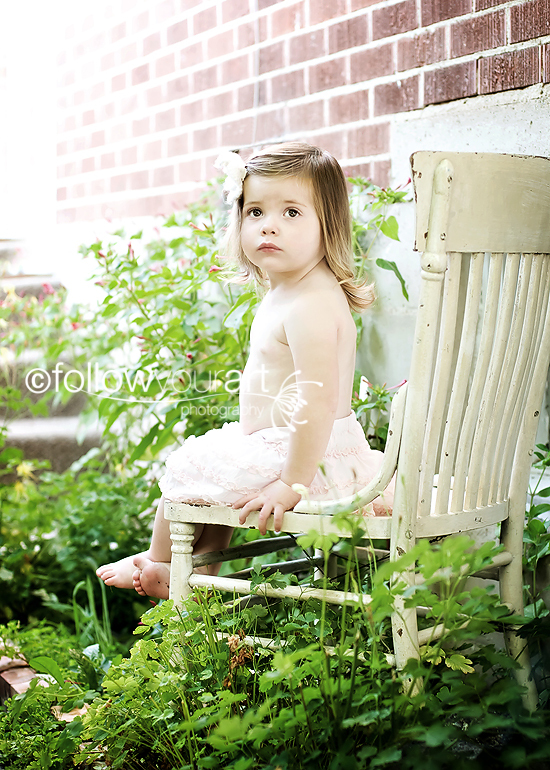 Oh and you did an amazing job on the cute little girls pictures of the family I just took. Thanks again everyone! I'm so happy that I have such great blog followers, you guys rock! I am all about the story behind the photo...and I think that makes the color one perfect! When I think of a garden I want to see the colors....YKWIM? She is such a photogenic little stinker! So fun! Just wanted to let you know that I can see your photos in both Firefox & IE. I prefer the B&W! I love the B&W, she is such a doll! I say color for sure! The green is too pretty to put it is b&w. Wow thanks for all the replies. It looks like black and white has taken the win. Thanks again for your opinions and kind words! Ooh I have to say I like the color better, I like the way she stands out in all the green! Great shot as always!